My strawberry plants have thrown an impressive amount of runners during the Summer. One of the most frequent questions people ask is how to grow new Strawberry plants from runners? I have done it in three ways, so there is more than one answer to this question. In fact this may happen even if your strawberries grow in a container and you locate your container right next to the spot where you want them to grow in. I have placed my strawberry containers right next to a raised border and voila the strawberries have now successfully migrated to a raised border. This saved work as I don't have to dig holes - which would have been the case if I had transplanted them from a pot. The other technique I have used is to fill a small pot with a dirt and then press the tip of the strawberry runner which is growing the new leaves against the pot. For this I used small sticks as I didn't have any wire at hand. Most bloggers on the internet recommend wire. But in truth you can use just about anything that is at hand and can do the job - use your imagination. After the new strawberry plant roots into the pot you can cut the runner and then transplant the strawberry to a new container or another border - or why not offer it as a gift? In summary - growing strawberries from runners is the easiest job in the world and can save you a lot of money in new plants. I haven't written for a while. That's because I have been collecting the fruits of my winter labour. The strawberries have been plenty and I have been having strawberries for breakfast every day. However what really surprised me were the cherry trees. We have started eating the most delicious cherries at the end of May. Even though we are incapable of waiting for the cherries to be fully red, the cherries are still very sweet and juicy. Not even a tint of sour. Another surprise is that even though my garden is full of birds they seem to be ignoring the cherries. I like to think that it is God watching for our cherries. But there may be a more scientific explanation like they already have plenty of cherries elsewhere. The squirrel that terrorised our cherry tree last summer is nowhere to be seen which is a bit odd too. 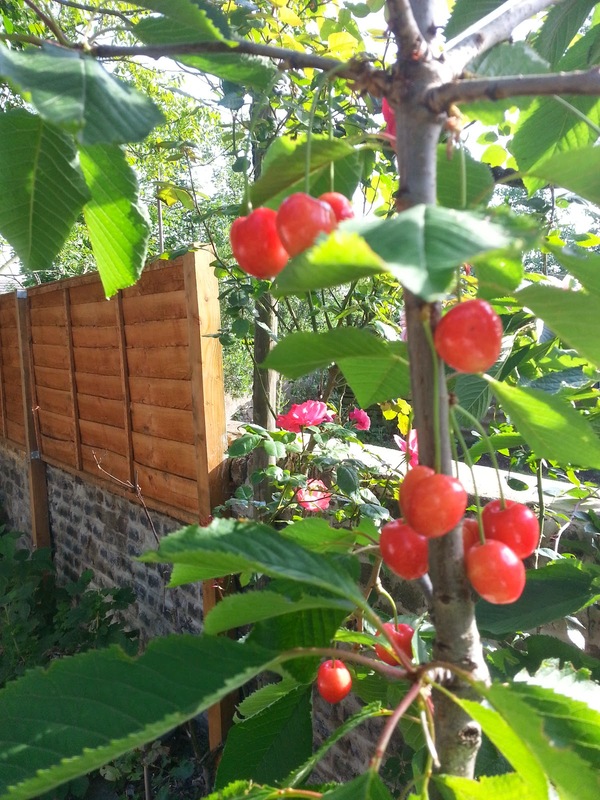 My advice for anyone living in London and with a garden is if you want to have cherries plenty for years to come buy a cherry tree. 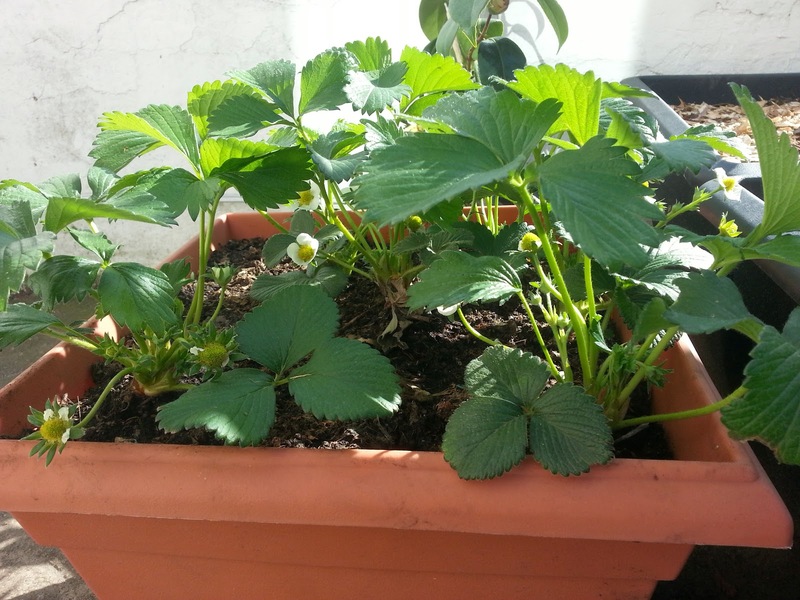 Strawberries are easy too - both in compost or planted in dirt. 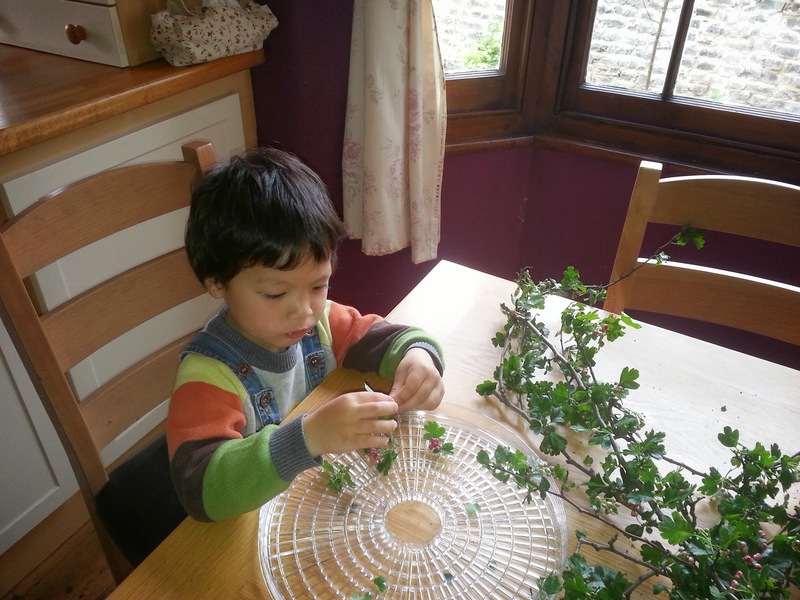 This week our hawthorn is in full bloom and as planned, we wanted to make Hawthorn tea. Three wood pigeons are devouring the blossom non-stop so I can't leave it for next week. Hawthorn in bloom you spot the pigeon? 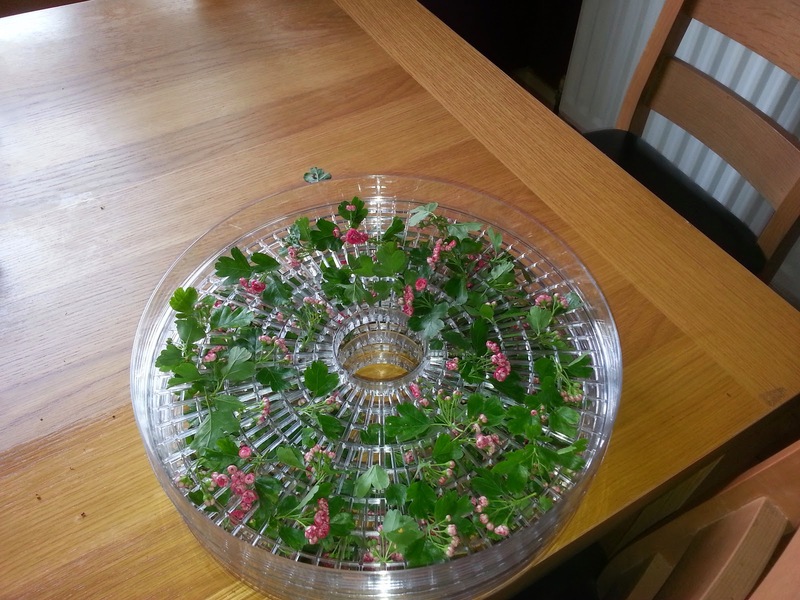 The process to make Hawthorn tea is pretty simple: cut the branches, nip off the leaves and flowers and place them in a food dehydrator tray flat. A food dehydrator comes with 5 or six trays, which stack on top of each other. So even though the process is simple, it requires a bit of tedious manual labour. Finally you need to switch the food dehydrator to the lowest setting(35 celcius) and wait approximately 12 hours. You will know when its done because the leaves will crumble when you touch them. The Hawthorn tea is supposed to have lots of health benefits. For a start it can increase the blood supply to the heart which is very beneficial for those who suffered from heart attack. Obviously don't take my word, as I am not a doctor. I am just doing this tea for fun and I am not looking to use it as medicine. I have tried the tea and the taste is nothing to blog about - not bitter - just not much taste. However it is the first tea I have made with my son - which kind of makes it special and especially fun. Today is Easter Sunday, the day of the resurrection of our Lord. A day to celebrate. Believe it or not today I was relieved that it rained. It hasn't rained for almost two weeks now and the garden was needing it. Mind that I got wet just when I came back from church. The strawberries are thriving, at least for now while they aren't ripe yet. 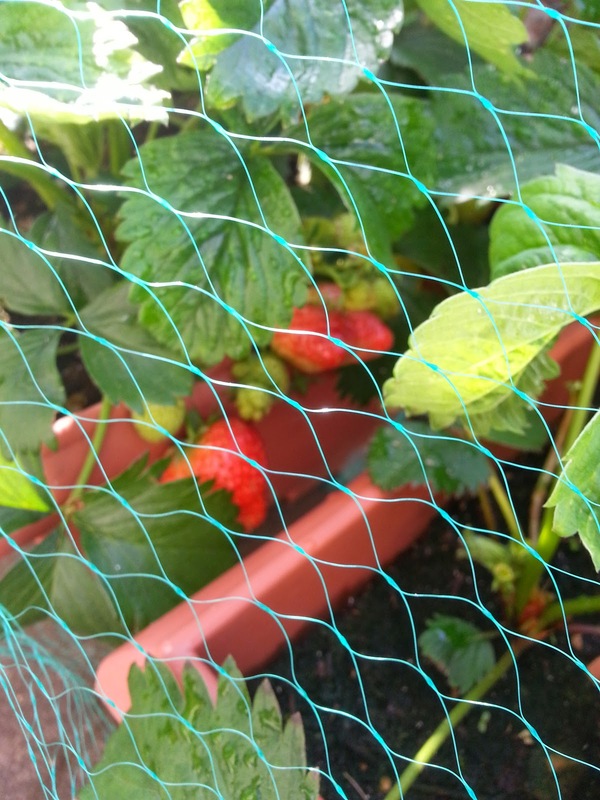 I am starting to search for bird nets on the internet as I suspect that as soon as the strawberries ripen they will disappear. My other strawberries seem to have a sticky substance in the leaves. I found the bug that seems to be responsible for this - but I yet do not know its name. 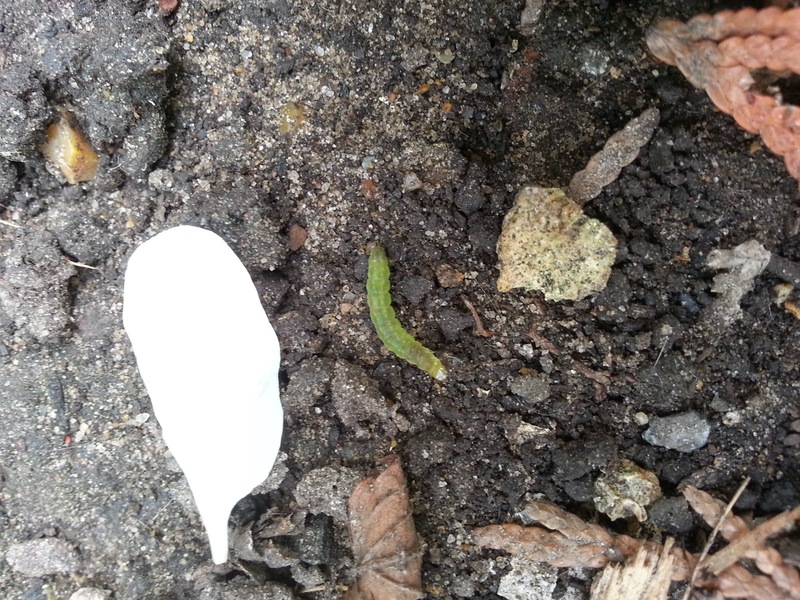 It is some kind of green larva. It seems to prefer strawberries as other plants are nearby with no visible sticky substance. 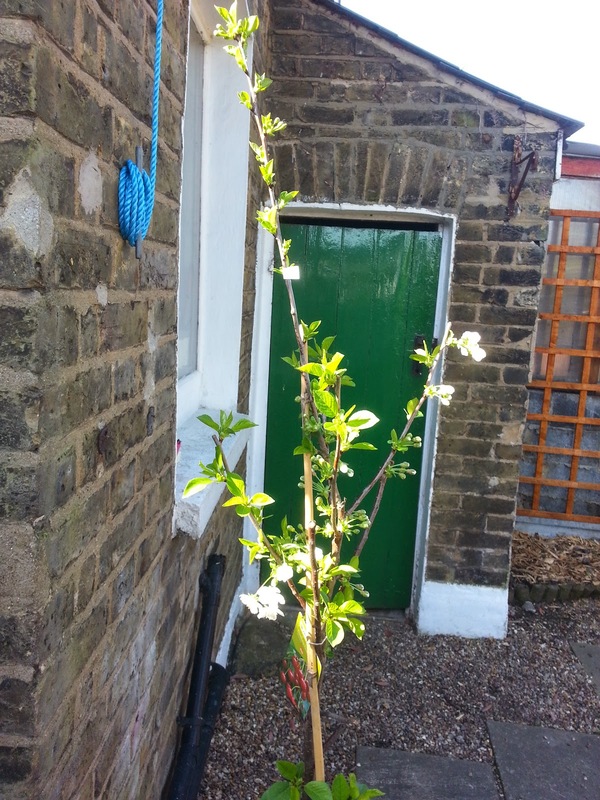 The apple trees are still in blossom and the cherry trees started doing what they do best: to produce cherries. I am yet to buy tree nets as I struggle to find the right kind on Ebay. In the meantime I have started some tomatos, string beans and french dwarf beans from seed. They are still indoors and growing well. I will have to wait until May to plant them as right now is too cold. 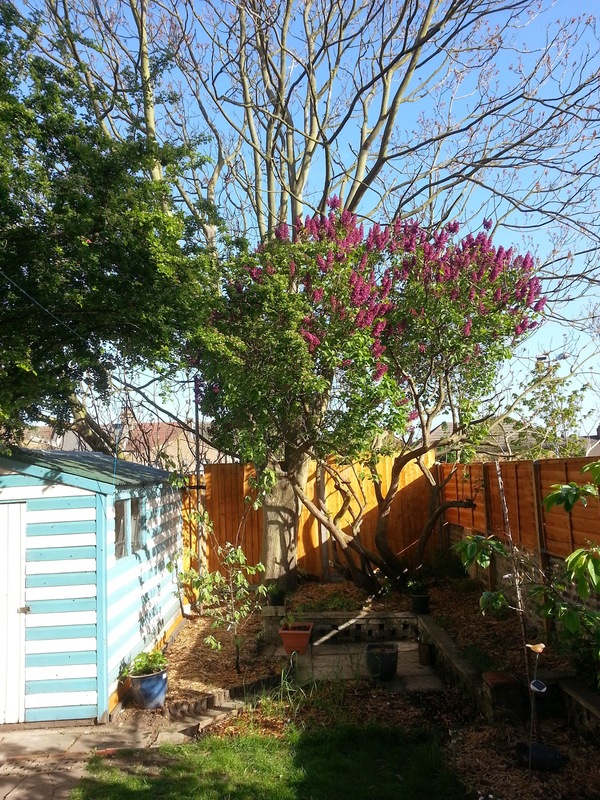 The Lilac tree is more Lilac than ever. Quite beautiful actually. 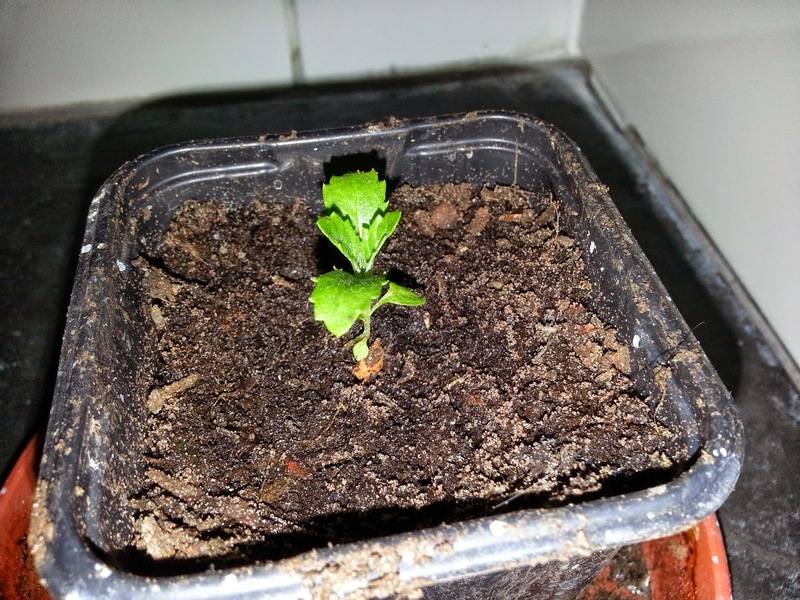 The May tree(also known as Hawthorn) is getting there. I can already see the flower buds. But not worth a picture yet. 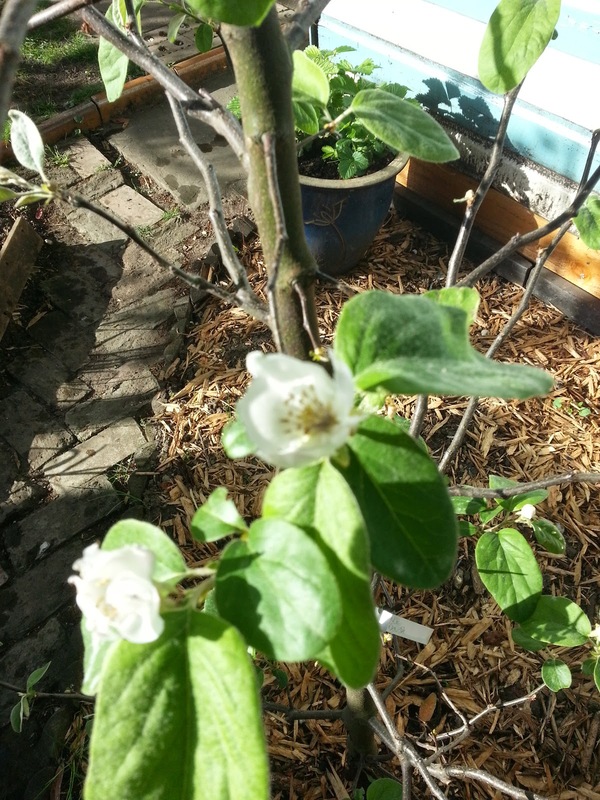 Finally, the Quince tree is also in blossom now. Currently I am not happy with the tree shape but I will wait until its in full leaf to see how I am going to prune it. 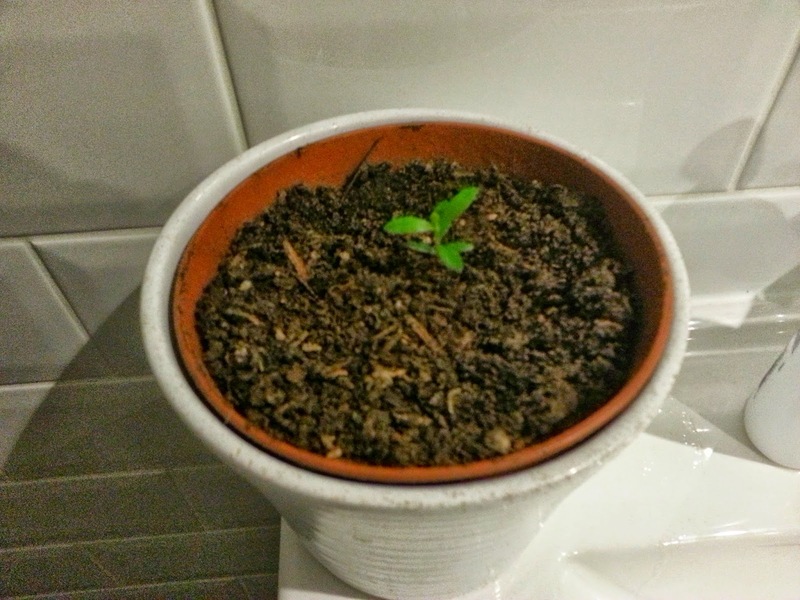 This is Spring week 3 - and here is my garden update. The Stella cherry trees blossom is nearly gone. So now it is just the question of waiting for the fruit. 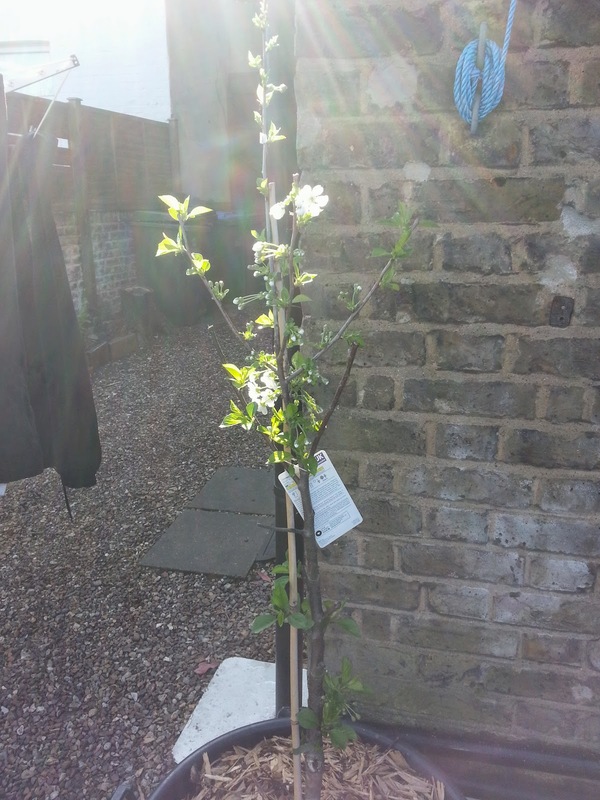 The Morello cherry tree, the only cherry tree that I am growing in a pot, surprised me as it is also in flower! I bought it over winter and I am not disappointed. Now I need to work out tactics for defending the cherries. This week I spotted the resident squirrel. I was starting to think that may be the local cats scared him off. That was wishful thinking I am afraid. If I want to taste any of the cherries I need to net the trees and maybe distract the squirrels with peanuts. Will that work? I guess that I will find out. 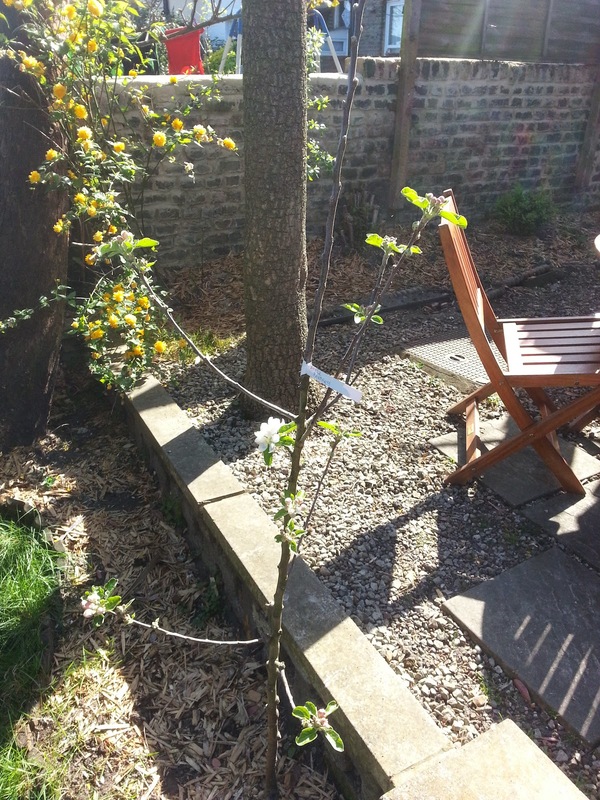 The quince tree hasn't flowered yet - but I am certain that it will. I have to confess - that I am a bit disappointed with the look of the tree - the shape is very odd. I am still trying to figure out how I can prune it to an appropriate shape. 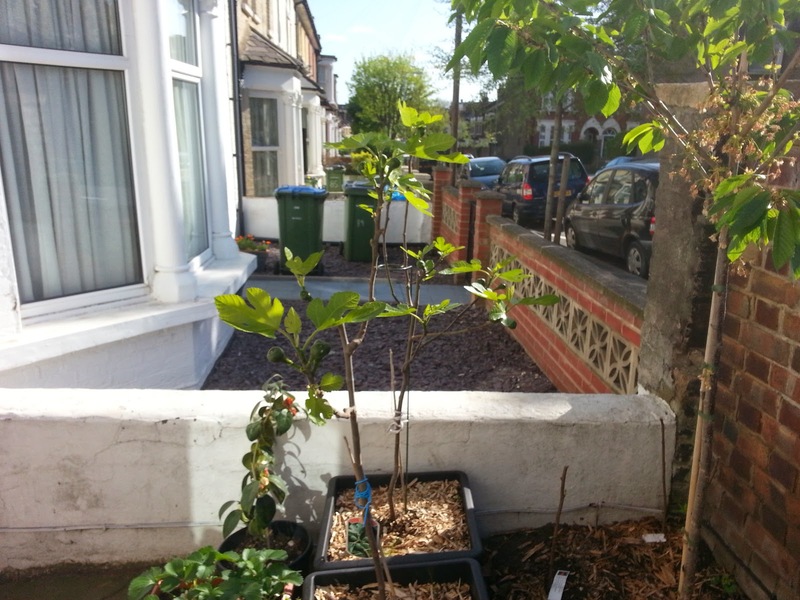 The potted Brown Turkey fig trees are doing very well. I am hoping that with a warm weather I will be able to enjoy some nice figs in July. Unfortunately that will also mean that I need to net the trees to protect the figs against birds. 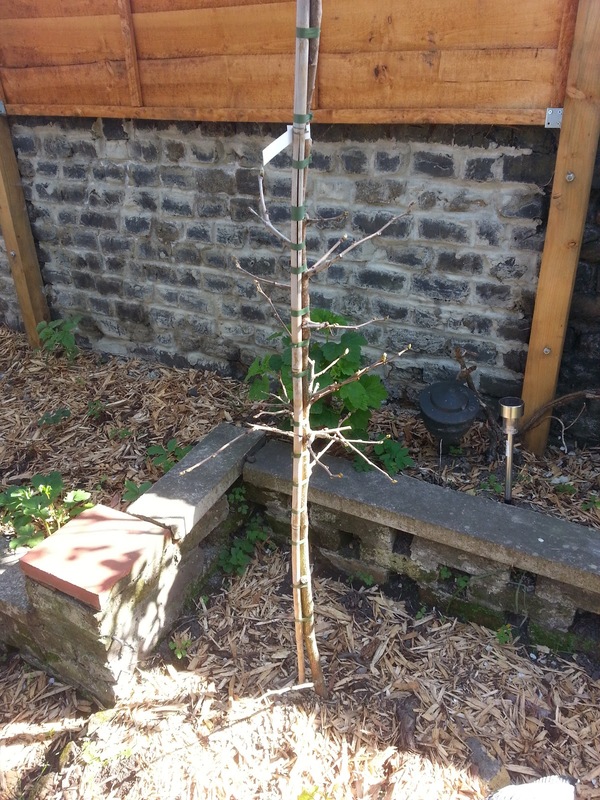 The Czar plum tree still has shown no signs of life. I will give it another month. 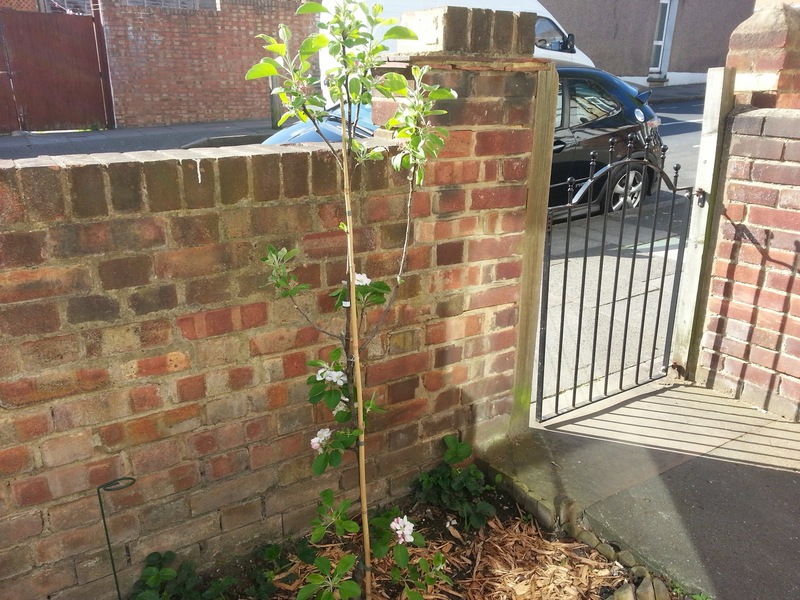 I did plant it a bit late in March, furthermore all the shade doesn't seem to be doing any good. 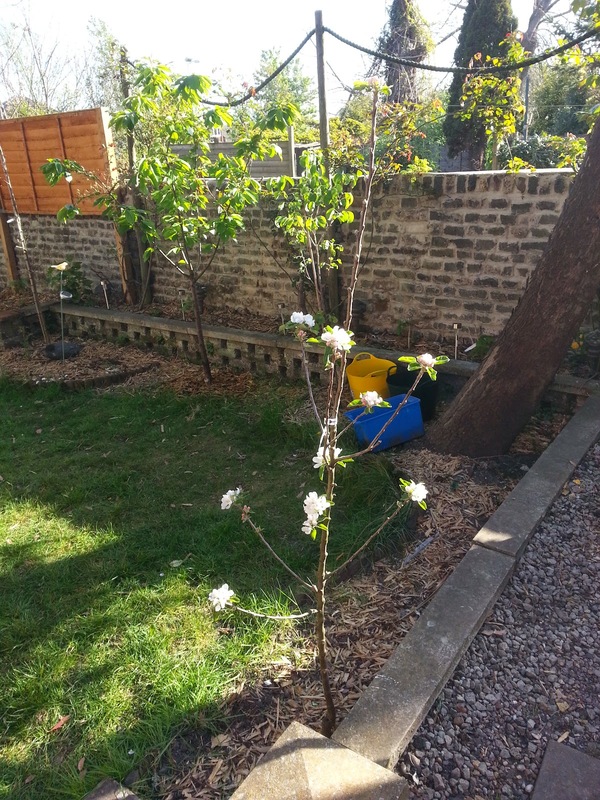 On the other hand the Victoriam plum tree is doing very well, despite not having a lot of blossom. But its the first year only. The strawberries are doing very well. Plenty of flowers which hopefully means plenty of strawberries. I am hoping to get some extra pots. 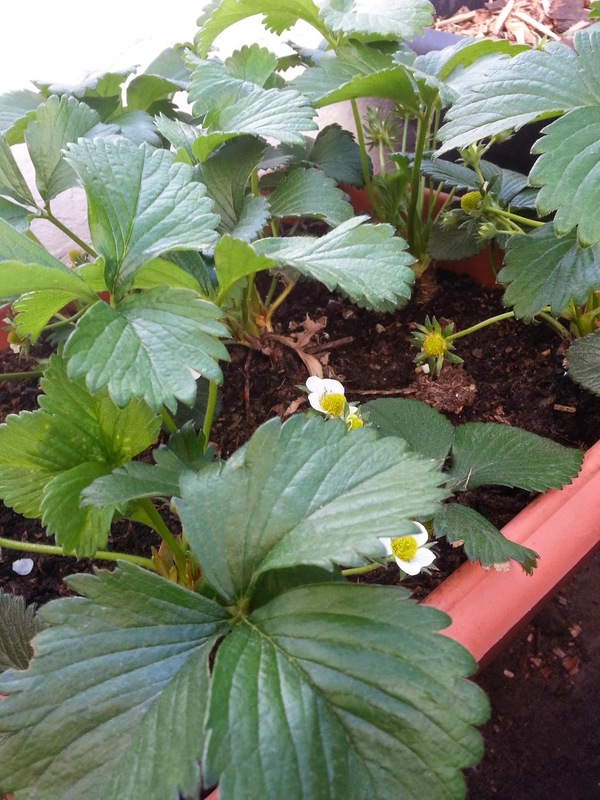 Strawberries seem to thrive in pots. A lot easier than growing on the ground. 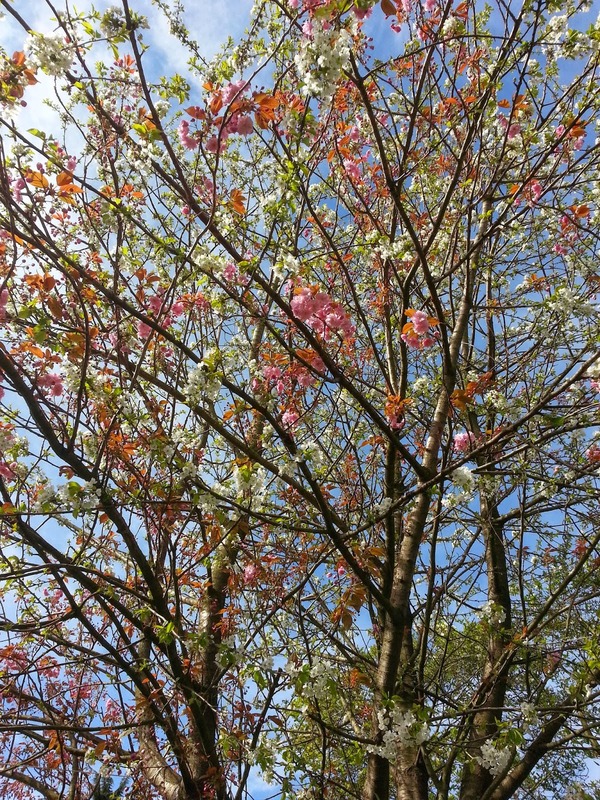 The Lillac tree has started flowering. The Hawthorn is in full leaf. It should flower soon. I think I mentioned this before. I will try to make some herbal tea out of the hawthorn leaves and flowers. I have already had a go at eating the leaves and don't seem to taste anything like cheese. The leaves of the Hawthorn are called the bread and cheese. See earlier post. 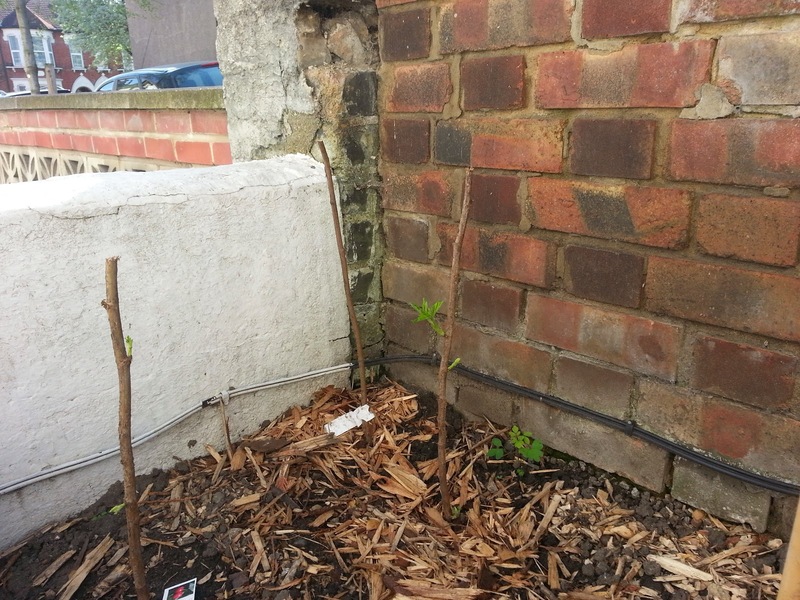 The raspberry canes are also showing signs of life. I learned my lesson. It is best not to cut the canes immediately after planting. 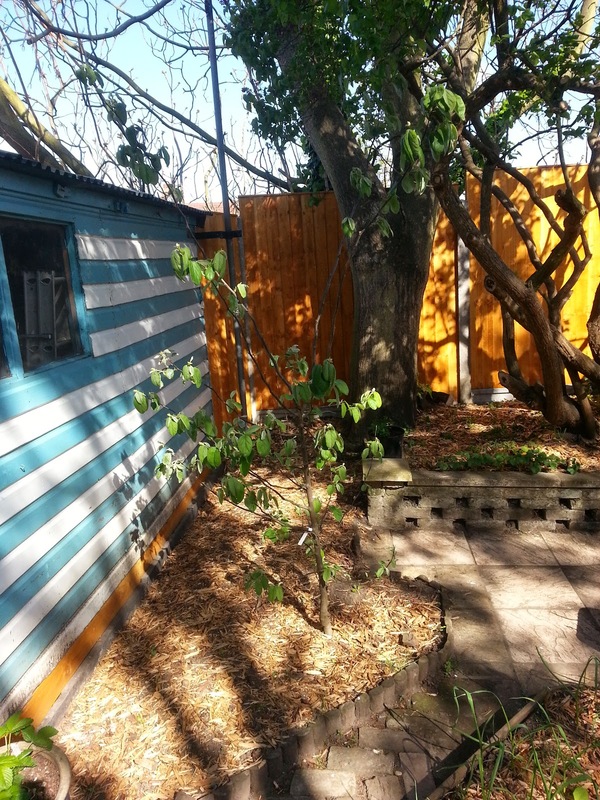 It is better to leave the canes alone and wait until they establish themselves first. This is of course my personal experience. Other gardeners may find that the exact opposite is true. I have very little experience, don't forget that. I am really loving it. Three weeks of spring and so much has changed. And I was going to forget. 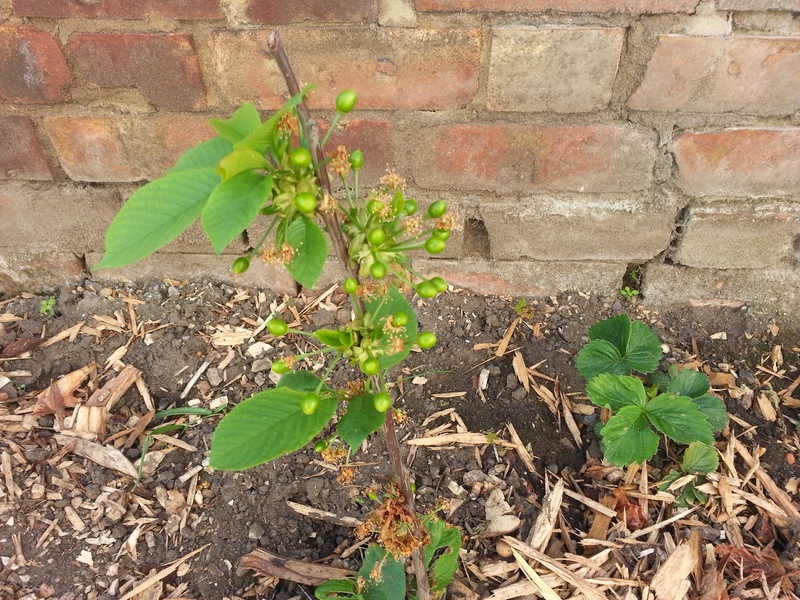 The mulberry tree is awake. I am certain there will be no mulberries this year, but miracles do happen. God knows how my garden will look in 10 years time, but one thing is certain. 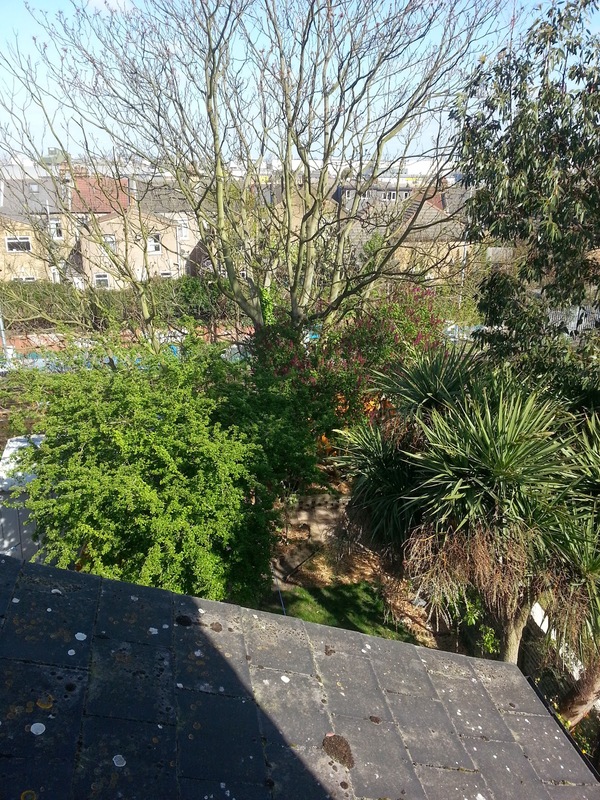 If every tree thrives I will be doing a lot of pruning. 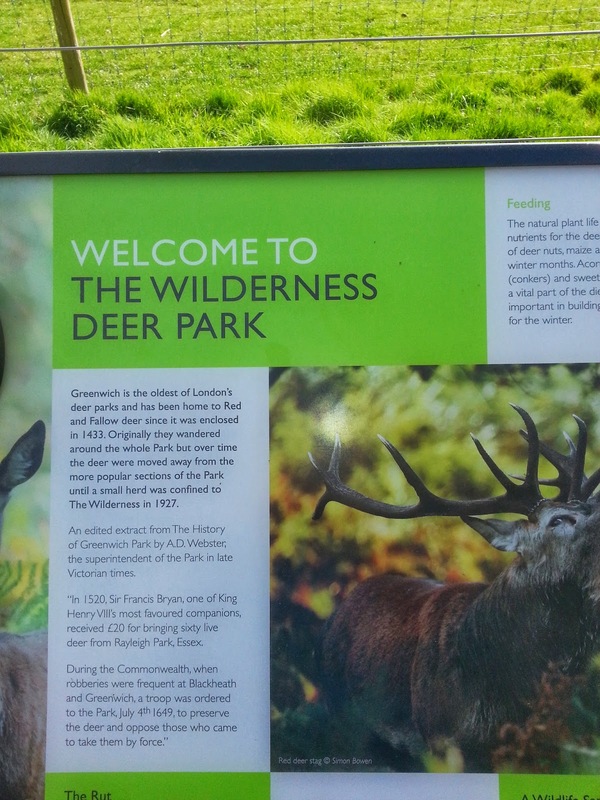 In the morning I took my family to Greenwich park in Greenwich. We go there regularly as it is close to us. 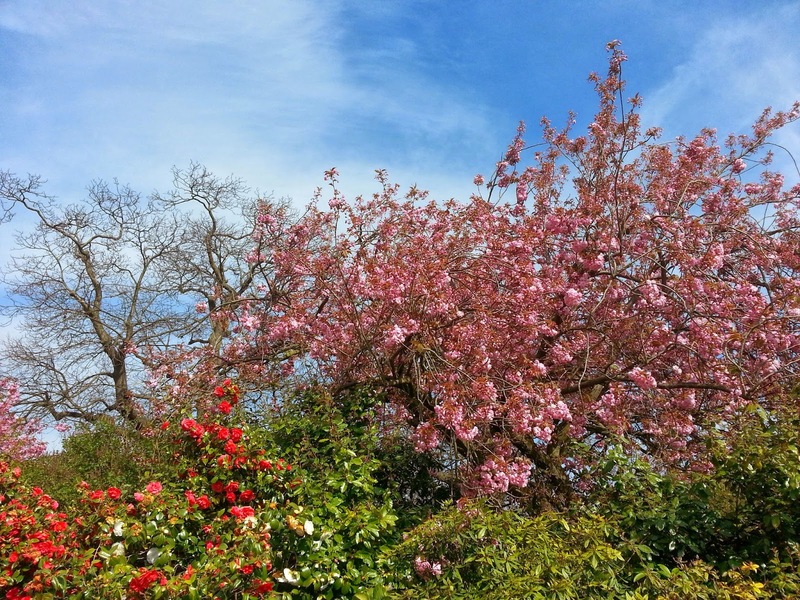 Now it is the right time to visit the flower garden and enjoy the flowers, especially the Cherry blossom. We were not disappointed. It was great to see the park full of colour. Cherry tree with pink and white blossom??? 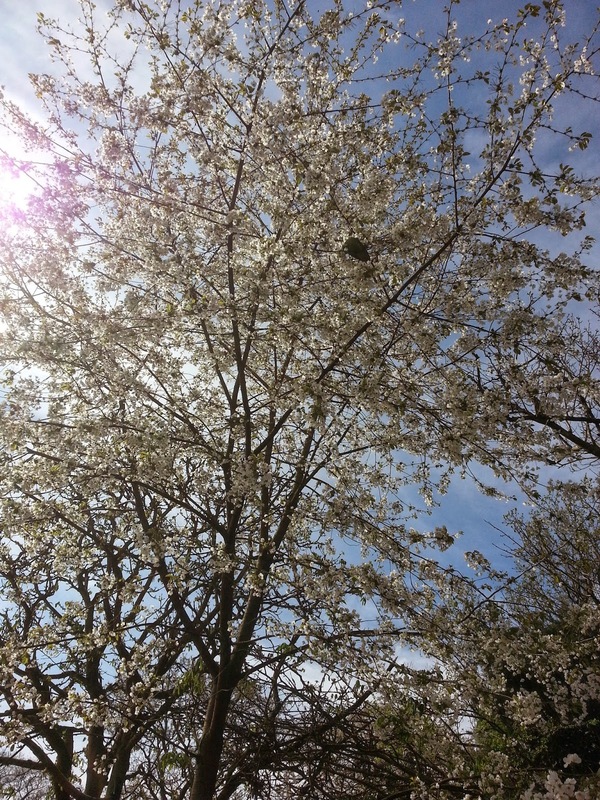 It is the first time that I notice that the same cherry tree can have white and pink blossoms. This is likely the result of grafting two varieties of Cherry together. The result is quite spectacular. Greenwich park as usual was teeming with tourists eager to visit the meridian line. 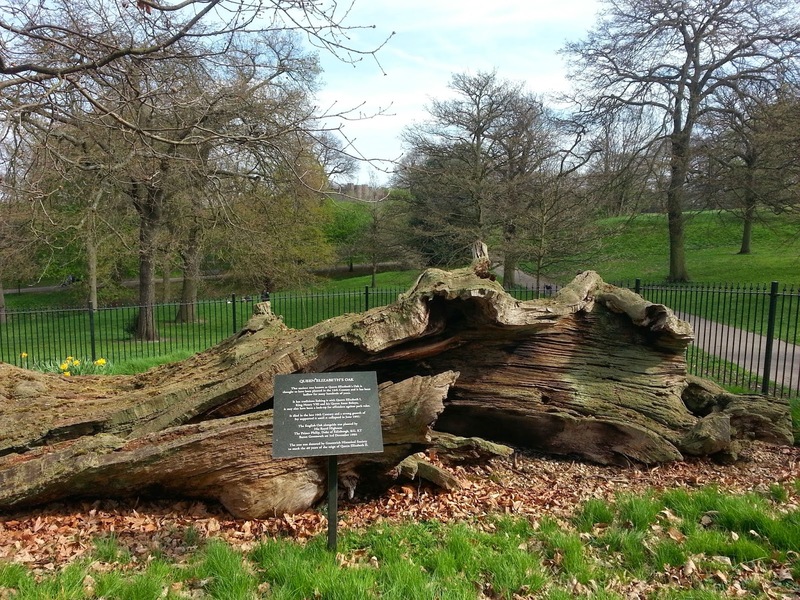 This tree was planted in the 12th century and it was standing until 1991 when it was brought down by rain. The tree is thought to have died in the 19th century but it was able to stand until 1991 because it was supported by Holly and Ivy. It is completely hollow in the inside and apparently it was use to lock up for the day any park visitor that broke the rules. 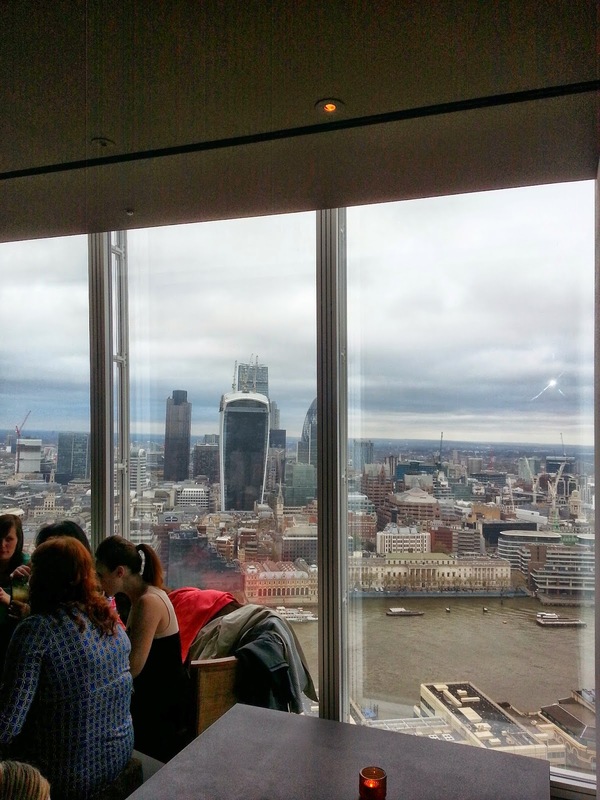 The Oblix is a sleek restaurant on the 32nd floor of the Shard. We didn't go for the food but just for the view and the drinks. The cocktails, coffee, tea and beers were quite reasonably priced taking into account the view of the London skyline. £3.50 for a tea? That's a bargain taking into account the cost of the ticket to the top of the Shard(£22). I went for a Martini Americano, a rather strong cocktail which instantly warmed me up. The Walki-talkie above is a special building. Not only because of its Walkie-talkie shape, which is derived from the fact that it gets wider at the top, but also because it will have a rooftop sub-tropical garden i.e. sky garden. This sub-tropical paradise will be free to the public! You will need to book a time slot before visiting as there a limited number of visitors allowed per day. 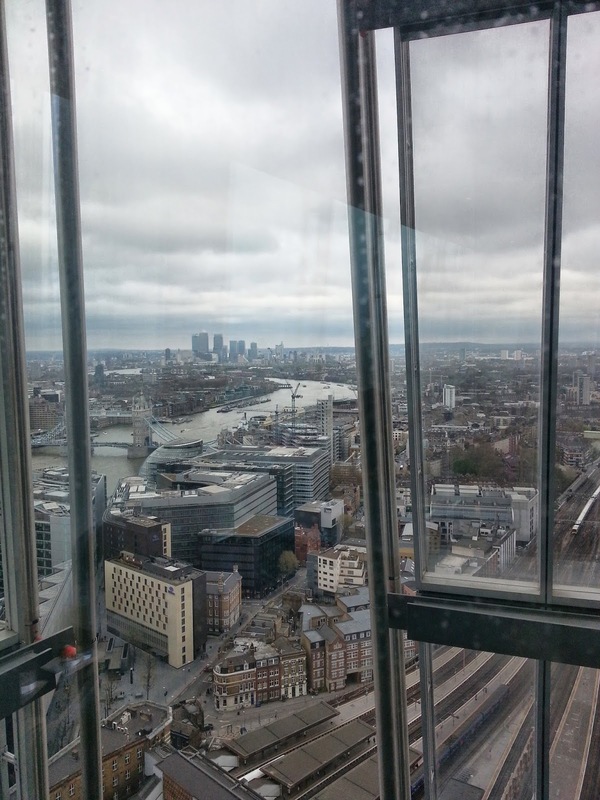 In addition to the sky garden, there will be a view to match. I am really looking forward to the opening in December this year. Recently there has been a lot of negative press about an excess number of skyscrapers planned for London, which to be honest is deserved. But for me the Walkie talking is going to become a top London attraction. It will definitely give the Shard a run for its money. Did I already mention that its free??! Just before Christmas I bought some pineapple guava seeds. For those who don't know what a pineapple guava is, here is a brief introduction. The pineapple guava tree originates from Brazil and it is very popular in New Zealand where it is sometimes called the New Zealand banana. The fruit tastes like a pineapple mixed with strawberry. But in all honestly I've never eaten one so I am only saying that because that's what I read on the internet. The pineapple guava favours a subtropical and low humidity climate. 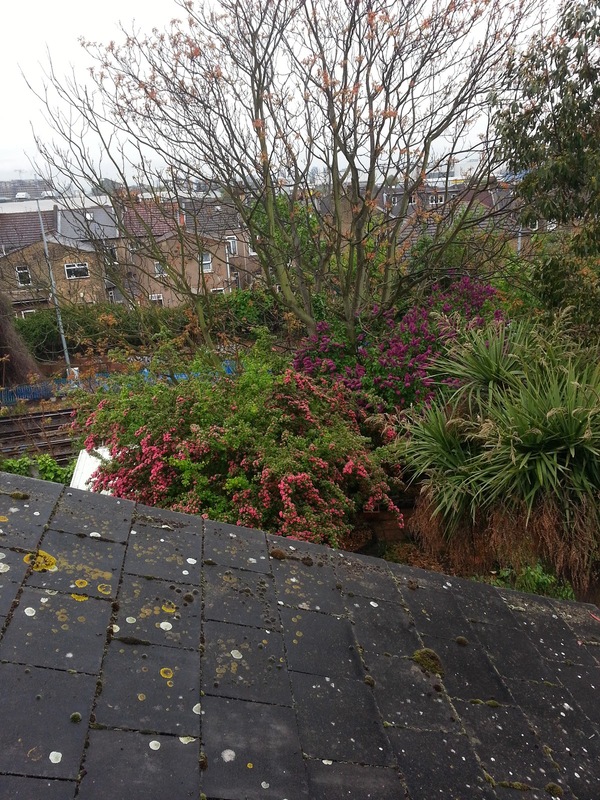 So not exactly the match for a London garden? Well I decided that I didn't want to spend too much money buying a pineapple guava tree but that it would be worth trying to grow it from seed - it only costed a couple of pounds. Only two of the seeds germinated properly. Now three months later, I have two tiny plants. Trouble is that they should look similar but they don't. One is a pineapple guava and the other is obviously an impostor.